UPDATE: In October 2006, after a Milwaukee judge issued a permanent restraining order barring Ann Ladd from approaching Bob Uecker and attending Milwaukee Brewers games, a felony stalking charge against the Illinois woman was dismissed. The judge's order reportedly satisfied Uecker and prompted the Milwaukee district attorney to drop its criminal case. 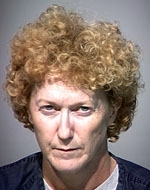 6/30 UPDATE: Accused stalker Ann Ladd was arrested last week on a felony charge of harassing Milwaukee Brewers announcer Bob Uecker. Ladd, pictured in the mug shot at right, has been ordered to stay away from Uecker and any ballpark where the Brewers are playing.